This handcrafted bracket bracelet of recycled fine silver features a typographically set quote with a high-contrast oxidized finish and a distressed “paper texture” finish to the surface of the silver. It is embellished with your color choice of silk ribbon. **Please note that ribbon choices are limited to stock on hand and Etsy does not offer inventory tracking across multiple listings. I will do my best to keep everything up to date but will contact you for a second choice if your first choice is sold out. The silver piece measures 1.5” wide and 1” high. The ribbon wrap is 100% luxuriously soft silk and is hand-dyed with hand-sewn edges that taper to a soft point at the ends. 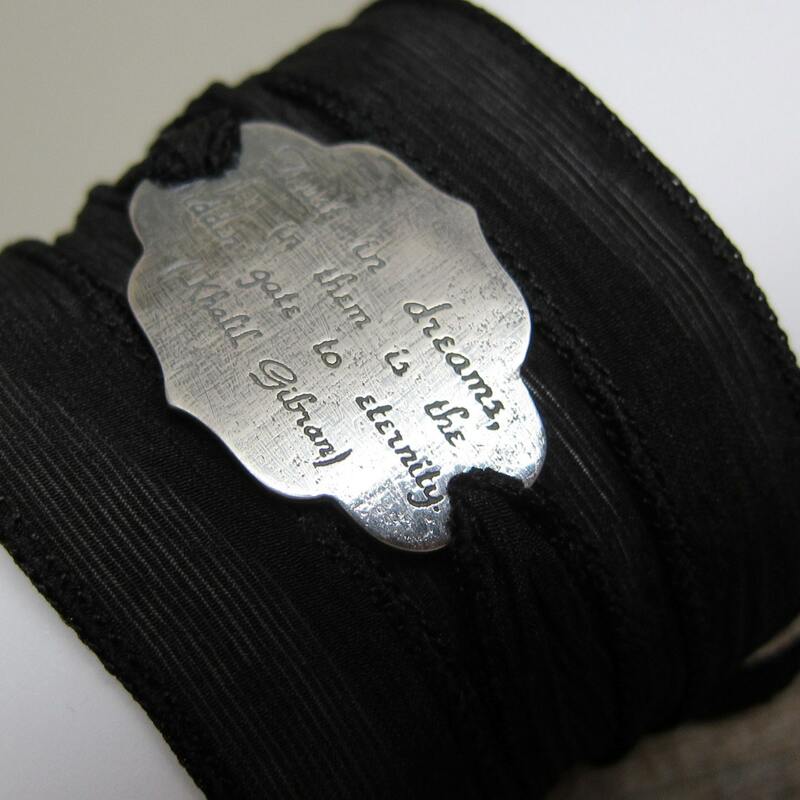 The ribbon is 34-36” long and will wrap several times around your wrist. To wear, just wrap the ribbon around your wrist and tie. The ends can be left loose or tucked beneath the wraps. Knots can be tied along the length to add a bit of detail or adjust the fit. The bracket can be nudged along the ribbon depending on whether you want it to to be centered among the wraps or situated along the top or bottom edge of the bracelet. These are versatile, comfortable, and elegant.